During this special Thanksgiving week edition of the program we're going to do something a little bit different and share with you an enlightening and spirited interview our friend David Morgan did with Sean Kerrigan of the SGT Report recently. David and Sean answer the question on seemingly every precious metals investors' mind, which is how much longer can the manipulation in the metal markets go on? 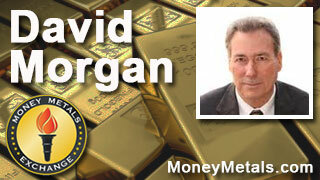 Don't to miss this special interview with David Morgan of The Morgan Report coming up after this week's market update. Today millions of shoppers are partaking in the great American tradition of heading out to stores en masse in search of holiday deals. But they aren't likely to find any bargains as compelling as physical precious metals. That's because gold and silver spot prices have been marked down to multi-year lows. Prices are so low that they are below all-in costs of production. That means you can actually buy a gold or silver coin for less than it costs on average to mine, refine, and mint that coin. Gold prices are trending lower once again this week. They started the week on a decline and then got a bit of a bounce as news of a Russian plane being shot down by the Turkish military sent crude oil prices marching higher. But as of this post-Thanksgiving Friday, the gold market is now making even lower lows and to trade at $1,058 an ounce, now registering a weekly decline of 1.9%. Turning to the white metals, silver once again found buying interest as prices tested the $14.00 level. Silver is down 0.6% on the week and currently trades at $14.14 per ounce, having tested support at the $14 level once again earlier today, which held yet again – for now anyway. Platinum is off 2.2% on the week to trade at $838 an ounce, with most of that decline coming today. Meanwhile palladium is down 1.4% since last week's close to trade at $555 as of this Friday morning recording. In recent weeks, sellers of precious metals futures contracts have taken on unprecedented leverage in order to knock paper prices down. For example, inventories of physical gold on the COMEX have plummeted to the point where there are now a record 293 paper claims for every ounce of deliverable gold. Physical stocks of gold would be cleared out if just 3 tenths of 1% of paper contract holders demanded delivery. Meanwhile, despite spot price weakness, gold demand remains robust. According to the World Gold Council, total gold demand came in at 1,121 tons for the third quarter – an increase of 8% compared to the same period last year. This despite some weakness in normally strong seasonal jewelry demand out of India. Analysts at Capital Economics expect demand out of both India and China to grow next year by 6% and 5%, respectively. Where the new supply will come from to meet growing demand is a big question mark given that the mining industry is being forced to contract. The supply and demand outlook looks increasingly bullish for metals prices. Unfortunately, supply and demand fundamentals don't determine prices, at least not in the near term. Gold and silver prices tend to overshoot on both the upside and the downside. That's a tremendous source of frustration for analysts who are always looking for prices to normalize. But investors can take advantage of the extreme situations by buying when prices are extremely depressed and selling when prices get extremely overextended to the upside. It requires a great deal of discipline and patience to buy low, hang on for the ride, and eventually sell high. Above all, it requires a long-term perspective. Precious metals markets may not make any sense in any given year. Only over a period of many years do they serve as a reliable inflation hedge. Keeping pace with inflation would be much simpler if you could just invest in Thanksgiving dinners. The cost of an average Thanksgiving dinner hit a record high of $50 this year – a 7% increase over last year and a 100% increase since 1989. That's according to the American Farm Bureau Federation. A hundred years ago, you could enjoy a Thanksgiving feast for around a dollar. Today, your dollar gets you about 1/50th of the turkey feast it once did. But before you call your broker to ask about investing in turkey futures, consider the practical advantages of precious metals. They are hard assets that won't spoil, can't default, or go bankrupt. They also have the potential to vastly outperform food prices and other inflation indicators when they emerge from their current depressed levels and enter into new cyclical bull markets. We certainly hope you'll consider giving physical precious metals as gifts this holiday season. Gold and silver are great alternatives to cash or gift cards. Whether it's fractional size silver rounds as stocking stuffers or a full ounce gold coin as a special gift for a special someone, Money Metals Exchange can help you give the gift of sound money. Availability of some bullion products is tight given current market conditions, so be sure to place your order soon to ensure delivery before Christmas. And as a reminder there are just a few short days left in our November freebies promotion. Invest just $500 and shipping and insurance is free between now and November 30th. Buy $5,000 or more and you will also get a free Silver Eagle. And now, without further delay, let's hear that fantastic interview between David Morgan and Sean Kerrigan of the SGT Report. David Morgan: Telling the truth during times of universal deceit is a revolutionary act. Well welcome to the counter revolution. We have gone from a constitutional republic into a fascist system that my good friend Aaron Russo talked about so many years ago. Now it's time for a counter revolution to bring us back to the principles that our forefathers found worth dying for. Sean Kerrigan: Hey friends, welcome back. Thanks so much for pushing play. I have the one and only David Morgan back on the line. David how are you sir? David Morgan: Well I'm doing well under the circumstances Sean, thanks for having me. Sean Kerrigan: I got to tell you man, it just feels like the cartel is throwing everything and the kitchen sink at us and it's getting so disgusting and people are feeling so demoralized for having done the right thing. Right? By trying to protect themselves against economic collapse and hyperinflation by buying precious metals, that it's starting to feel like David, that these people in control, this cartel, is so hell-bent on "demonetizing silver", right, making it appear worthless, that even those of us that know the true history and value of physical precious metals, even we're getting disgusted. Because when you buy at $15 you think it can't get any lower, and now we're staring at the face of $14, $13, I mean they could just take it to 0 David. The only thing I think saving us is other nation-states, other cultures that do appreciate physical precious metals. If it weren't for India, if it weren't for China, if it weren't for Russia, if it weren't for these other nations that actually care about precious metals I'd feel like "Well, the fix is in and we're never going to beat these bankers." How are you weathering the storm? David Morgan: Well, personally I'm doing okay because I've been through it before. Secondly a guy that's been investing and trading in silver for as long as I have, I pretty much have ice water in my veins. Not to say it hasn't gotten to me, and I'll reiterate a little of what you said and add on to it. First of all if you go back to just very recent history and you looked at what I estimated conservatively at about a 5 million ounce backlog, we started to see the silver price finally reflect this silver shortage in the retail market and we moved up into the $16 level. Once that was satisfied then the premiums came back down and we're normalized we saw the price start to back off, which I expected to see, but not you know, under the $15 level, not to this $14.17 print that we're seeing as we're doing the interview. It is very disheartening. What I do know are some facts. One is I love to stay with the facts. The facts are that one, no manipulation has lasted forever. Again it bears repeating and probably people that have listened to me are tired of hearing me say it but it is also a fact, that the paper price on gold and silver in no way reflects the true tightness in the market. If you look at the gold side for a moment and even the World Gold Council, which is not that friendly to gold believe it or not, stated that there was pretty hefty gold demand in the last reporting period on an annual basis. And yet we see these prices struggling into a new low territory, perhaps testing the Nouriel Roubini price of $1,000 an ounce in 2015. This makes absolutely no sense. A third grader knows that supply and demand has some value in a true free marketplace, and yet we see this derivative structure, this paper paradigm as I like to refer to it, controlling these markets. Especially the metals but all these markets are controlled. If you control the interest rate of money, if you control the value of money, then you basically control all markets. The reason I say that with authority is because it's true. If you're able to put money and determine the interest rates at will, then the free market has no place to value the most important commodity in economics, that is what is the time value of money going forward. We go through that in the book The Silver Manifesto, I don't want to go on a big intellectual discussion about it, it's very basic, anyone can understand it. The point being is that the dollar looks great right now, compared to what? Compared to all the other losing currencies on the globe. The only thing that's every stood the test of time are metals that are money outside the matrix. That can't be taken away Sean. You know it, I know it and our listeners know it. Regardless of how you're feeling at the moment, stand true to yourself knowing that those elements, those physical commodities, those pieces of money and they always have been regarded as money, stand true and they are alone and of themselves valuable. Price is price, value is value. Try to do a paradigm shift on yourself, I have to do this to myself once in a while and say "Look, I've got more silver now than when I started back in ‘99." I started when I was a kid really but what I mean is when I started the website in the public domain until now. I feel it's more imperative on us, meaning the Seans, the Davids, the Gregs, all these people that are out there that are still speaking from the head and the heart and telling the truth, knowing that YouTube and some of the other powers that be were pretty friendly to the alternative media, are now starting to put the screws down on us. For doing what? Telling the truth. As George Orwell says, "Telling truth during times of universal deceit is a revolutionary act." Welcome to the counter revolution. We have gone from a constitutional republic into a fascist system that my good friend Aaron Russo talked about so many years ago. Now it's time for a counter revolution to bring this back to the principles that our forefathers found worth dying for. End of soap box, I had to get that out. We're getting closer to the end, day by day. The metals will survive. Sean Kerrigan: Yeah, thanks for that. Man you've got a fire in your belly today. I like that because that's how I feel too. We know that there are no free markets, at this point all markets are being manipulated by the fed. But one thing that we also know is true, which Mike Maloney has pointed out, and Jeff Nielson and Maloney just pointed it out again in his new Hidden Secrets Of Money 6, but my friend Jeff Nielson pointed it out in a recent interview, is that the Fed has already hyper-inflated the dollar. If you look at the Fed monetary base, you can see a hyper-inflationary chart that proves that they've already hyper-inflated the dollar David. Even though they manipulate precious metals endlessly and it looks like they could take silver to 0 in the paper market, not literally but they could certainly take it down back below $10. The fact is they've already hyper-inflated the dollar, haven't day? David Morgan: Absolutely, I'd like to add on to that and look at it in a different way. As you know we have our mastermind group which, let's say the people that are obsessed about this market like I am, and money in general but particularly the financial markets and the honest money movement and how they interplay. I had Keith Weiner on that mastermind fairly recently, he pointed out something which emphasizes the hyper-inflation. I'm going to do 2 things, I'm going to go give a quick example and I know you have his example and obviously I'm giving him credit for this. If you go back in time and you go when, I'm in my 60s but you go back when I was in my 30s, if you've been a good steward of your own finances you might come out with, let's just make up a number, $350,000. You could pretty easily get 10% on that so you could get $35,000, remember I'm talking taking back to the past here. That would be not touching your principal, you would earn interest and you basically have a pretty good life on those days on that amount of income. Now let's go to present day with the ZIRP program, zero interest rate policy. What do you have now? As Keith pointed out, hyper-inflation, because why would I say that? It's obvious, because you would have to have something Sean like $40 million dollars in bonds at the 30 year interest rate to get something like $35,000 in interest, which is pretty low but you could probably survive on it today. What that means is you would have to have such a huge amount of cash saved in order to live off the interest, it proves you have hyper-inflation, in other words you have to have $40 million, $50 million, $60 million, $70 million at interest just to basically you've got a pretty average lifestyle in America. That's a hyper-inflation. I commend Keith for bringing that to my attention because I hadn't thought of it in that way and how relevant it is. Which goes all the way back to the beginning of the interview where I stressed what's in The Silver Manifesto, which is the interest rate on money itself, which is imperative to a free market paradigm, which we are not living in. We're living in this control mechanism. The only way I know for the average person to escape is to get out of the matrix and that means physical elements in your hand, known as money for thousands of years. Name one currency that's gone on more than a hundred years? There isn't, even the dollar has certainly been through many changes, even from the time I was a kid. When I was a kid it was a silver certificate and then of course I think when the greatest ever, John Fitzgerald Kennedy with the executive orders 10100001 or something like that, I'm sorry but it's the Executive Order basically, take the Federal Reserve board off of the issuance of money and put the United States Treasury as the issuer of money. This is a true fact. I have some files to prove it but it's easily proven. Of course one of the first things that happened after the assassination is Lyndon Baines Johnson signed the first Executive Order of his presidency to null and void that executive of Kennedy's and put us back on the Federal Reserve System. Certainly if you don't think money is power you're not thinking very far. Sean Kerrigan: Yeah, that's right. I want to ask you this too about our friend Mike Maloney who has been very consistent in saying "First we will see deflation, then a helicopter drop, then hyper-inflation." He's been saying that now consistently for several years. We're seeing the deflation and the helicopter drop that I think he's referring to is not QE1 or QE2, it's coming. It will an overreaction from the Fed because of massive deflation in the system that the big helicopter drop still lies ahead. Despite that Fed monetary base chart that we're looking at that already shows hyper-inflation of the currency, the worst may be yet to come David. Before this thing gets better they're going to even throw trillions and trillions and trillions of more funny money at the system in an effort to prop it up. Then hyper-inflation absolutely can't be stopped. Do you agree? David Morgan: Absolutely. One thing that I've done my best but perhaps I can do better emphasizing is the Exter upside down pyramid. You see that all over the net now. In fact I had a great discussion about it with Jake Taylor well over a decade ago. This is his work, not mine, but John Exter showed very clearly that as the run of liquidity begins the last point before the run to gold starts is a run to the U.S. dollar. That's what we're seeing as we said earlier, the dollar is the strongest thing out there. Compared to what? All the other fiat currency. But that's what you'll see because a physical dollar bill in your hand is the most liquid thing you can have. If you're worried about a bank run or a bank failure or being Cypruss-ed or being Argentine-ized, that's my word… or like the Greeks where you can only get so much out of an ATM. I've tried to help people on that in our free mailing list and wake them up. Now that's the extreme view, I want to state that. I'm stating it for emphasis because I want people to think. I want critical thinking to take place on why you need some precious metals. Does this mean "Oh David's right and I need to cash out everything and put it in physical metal"? Absolutely not. Nature preaches balance, you need a balanced attitude toward life, you need a balanced objective in your portfolio. But to neglect precious metals, which is 99% of the population that has saved something, is the biggest mistake that's ever going to be made. You know what? Once the ship has sunk, everyone knows how it might have been saved. What I mean by that is once the run to gold starts, you may not get in and once it ends people will say "My goodness, why didn't anyone tell us that we should have precious metals as of money of last resort? Why didn't someone stand up and tell us this?" Well of course Sean you have, I have, Mike Maloney has, many of us have. It just hasn't been broadcast from the mainstream media. Are we going to go to that type of hyper-inflation? I say we will not. I think we will go into enough of one to see a run to gold that's going to make the last run to gold throughout all of recorded history look like warmup parade. Because this time it's a global basis. China and Russia and India particularly have put away massive amounts of gold and it's questionable as to how much the United States actually has in physical gold that's unencumbered. Regardless I think when the chips fall where they may once that this fraudulent system starts coming to an end, we're going to see again as Greg Hunter has said "There'll be people that have it and they're will people that don't have it" and there may be people that are unwilling to trade it for fiat. They may trade it for land or some other tangible asset or a business or something like that. I want to continue on just a bit more Sean. The cry, all the way up, during the Weimar Republic was, believe it or not the cry all the way up was "There's not enough money." Can you imagine that? That during that entire hyper-inflation until the very end, it was "There's not enough money." So the banks obviously accommodated and they didn't think they were doing anything wrong. In fact in the beginning everyone cheered it, "Oh prosperity and things are moving and goods are transferring and we're paying back this war debt and we're happy." It kept going with that kind of an attitude for quite some time. Then it got to the point where people recognized it for what it was. It was just a printing press fiasco that was going to end in ruin. Life insurance policies that had value became worthless, so a postage stamp became what you used to pay for a block of buildings in a downtown area, that type of thing. All these things could take place. What you would do is you take dollars. 99% of the population, even on a global basis because the dollar is ubiquitous, think that the best thing they could have is U.S. dollar and they don't think beyond that. But the best and smartest know there is something well beyond the dollar because when the dollar fails where do you go? That's the run to gold. When the run to gold starts in a significant way, that's when you're going to see this paper paradigm derivatives monster blow up. Then you're going to find out just like in the movie Rollover, that I talked about so many years ago, take place on a real basis. That means that people that don't have it may not get it. There may be people that will say "I'm not willing to trade." Sean Kerrigan: Yeah that's right. You know those same people will wonder what happened to the gold in Fort Knox. You sort of made reference to that, we don't really know how much gold is backing up the US dollar at this point. There hasn't been a audit of Fort Knox since the 50s. You also mentioned 0% interest rates, that leads me to the topic of negative interest rates, bail-ins, social security cuts are probably on the horizon in the near term. Ultimately austerity may be coming to this nation. It reminds me of the Illinois pension problems. It reminds me of what's going ... Things are so bad as you probably know David in Illinois that lottery winners are being given IOUs. They can't even pay their lottery winners, the fiat that they have coming, instead they're going to get IOUs. That I think is a wonderful metaphor for the America of 2015, from Illinois to DC it's IOU America. David Morgan: Well said. There used to be an adage out there that as GM goes so goes America. I think that still holds. General Motors is basically propped up by this fiat system. Anyone that does a cursory look at Detroit realizes in what kind of position they are in, which is very, very, very dire. What you're talking about is a foretaste of that spreading throughout the entire system. It really is sad because the principles that made this nation great have been usurped by the power structure for their own benefit and the detriment of everybody that runs a system, which is, who is the hook for these massive deficits. Well it's the U.S. tax payer, that's who. Are you getting your value out of these people? Most certainly not. Sean Kerrigan: Think about it too, because that whole IOU metaphor if you really flush that out, you think about Social Security. The entire thing is really unfunded and it's paid on the backs of current workers to pay retired workers. It's an IOU system. The dollar itself is an IOU system, right? Everything printed into existence is beholden debt to the federal reserve and the funny money banksters. The lottery winners in Illinois being given IOUs whereas physical gold and silver despite it being decimated in the paper markets in terms of price, there is no IOU. If you have physical silver and physical gold, it's yours. It's actual wealth in your pocket, it's tangible wealth. Now of course these guys are going to manipulate it, manipulate it, manipulate it, because they want to save their fiat funny money but at the end of the day David when you have buyers like China and Russia and Saudi Arabia and India and nation states that are hoarding physical precious metals, India is on track this year I think to take down 33% to 40% of physical silver supply globally, that is the ultimate game changer. I guess my point is, and I'm sorry for the rant, but I guess my point is the Fed, the man behind the curtain as we've said so many times before, have been revealed on the global stage. It's not just you and I having this conversation, this is happening in boardrooms around the world. Wasn't it just Overstock.com, that CEO said "We're planning for a calamity. We purchased physical gold so that we can pay our employees. We've purchased food stores for when the collapse comes"? This isn't just you and I, this is happening across the country and across the world, people are having this very conversation. David Morgan: Absolutely, I used to close out most of my videos with "Be real, get real, buy real." That's where we're going Sean as you stated. We're going to a place where it's going to be a very easy balance sheet, meaning what do you have and what do you owe. You may owe a lot of fiat because you're in debt, and what do you really have, maybe something much different than you think you have now, meaning you could have a life insurance policy that basically you can't get access to or a bank account is probably a better example where "Oh yeah your money is still there" but like in Argentina you're only allowed to get $300 a month out of it or a week or something along those lines. We're going to that place where you need to know what you really have. If you have everything in their paradigm, you really better think that clearly through on what it means to you because believe it or not they're not there to help you. You're there to help you. It's shows like yours Sean that gives people at least the idea that they need to make a move. If you haven't made a move yet I highly recommend you start immediately. I don't like the hard sell and I don't like the immediacy type of sell. You know, "You only have two days to get this or it's gone forever", I don't really like that but I'm doing it. Why? Because I think we are so close, and the old adage I'd rather 6 months too early than 1 minute too late is something to think about because we are at a place where we saw recently Sean, where to get retail silver product wasn't that easy. Yes it only lasted 4 to 6 weeks, I get that. However the next time it may not be that, it may be where as I said earlier you either have it or you don't or you're willing to pay a huge premium. Sure there will always be someone trading silver for fiat or gold for fiat. That's at the low level, and that's fine. I'm just a regular person like anybody else. But on the massive scale where Central Fund of Canada or the PSLV or the Zurich Continental Bank or one of these large hedge funds comes in and wants to buy wimpy 20 million ounces of silver, which is a very small amount relative to the annual mine supply, and they get their feedback from the broker dealers, saying "Sorry we can't do that large an order." "How about 10 million?" "Maybe" You know, that type of thing. So we're reaching that point and I'm stressing it again because that point I think is coming sooner than many people believe. Sean Kerrigan: Yeah and I did recall that correctly, it's the Overstock CEO Patrick Byrne who came out publicly and said "Look we're holding 3 months of food and $10 million in physical gold for employees in preparation for the next collapse." Because as you've said David in this interview and I completely agree, the “next collapse” is coming and it's going to be far worse than what happened in 2008 because the Federal Reserve did what they wanted to do and they printed all this funny money into existence and they gave it to their banker buddies. At some point the chicken is going to come home to roost and the dollar will not be king for very much longer, certainly not for another 50 years. Okay, before I let you go a couple more things. This is from a reader and a contributor, a buddy of mine named Mark who asks, "At what point" now he's talking about spot price plus premium as it pertains to silver. I'm going to summarize real quick what he's trying to say, "At what point does it not make sense to buy silver at say $14 when there's a $3 or a $4 premium to get a Silver Eagle?" Because percentage-wise now you're paying what? 15% to 30% on top of the spot. "At what point does it become cost-prohibitive to buy physical precious metals? Because clearly that premium as a percentage of the overall cost is much lower when silver was at $25 and you're paying a $3 premium." What do you say about that? I guess I feel his pain. It's nice to be able to buy silver at $14 but we're really not getting it at $14, we're paying $16 to $18 depending on premium. David Morgan: That's a great question. The only to answer it correctly is it's an individual case by case basis. In his case where he's probably going to be in a situation where he will be striving to get 100 ounces of silver, as an example, ask for that. Ask, in other words birthdays, anniversaries, Christmas gifts et cetera. "I don't want a trinket, I don't want this. I want silver." That's one way. The other way is, is that premium worth it to you? Which I'm going to elongate this answer Sean. Welcome to the world of silver. Now why do I say that? Because in most areas of the world outside the U.S. and Canada, there's a VAT on silver. There's a value added tax of about 17% in most jurisdictions. Why is that? I'm going to leave that as an open question. Why don't you think about why Germany, England, many of the European countries have a value added tax on silver but not on gold? Something to consider, I'll leave that as an open question. What I say is, look if having half a loaf of bread is better than none, if I had to pay in extreme conditions more than I might feel comfortable from somebody middling a loaf of bread I would have to make the determination is it worth it or not. My guess would be yes, to get some. Additionally, let's go to where we are right now. Right now we're sub $15, silver as we're doing the interview and the all and sustaining cost for every silver mine in the world I can think of, and I'll take my numbers over anybody yes I'm very close to what Steve's (at the SRSrocco Report) numbers are, he and I are friends, believe me I'm pretty tuned into most of these guys and believe me it's not a one man show here. I've got 2 guys, actually 3, that work for me. Guys like Steve I stay connected to. The point being is that we're at a point now where silver is under the cost of production for all-in sustaining cost in every mine I can think of except one which is Tahoe Resources, I'll give you that one, you can go look it up. That's at $50 oil. If you go back in time or forward in time and you're looking at $70 to $100 oil, you're all-in sustaining cost at those same mines will be about $20 to $22 an ounce. I don't what your thoughts on the oil markets are. If you read, again, Steve St Angelo at his website and get into his work, he makes a very strong case that oil prices are not going to stay at these levels forever and if you go back to what Mike Maloney says about the hyper-inflation, the two most important commodities in the world are money and energy. Energy for the most part means oil, certainly natural gas and solar and all that stuff, but for the most part it means oil. So I would say yes. If you've got to ask, "Do I or don't I buy" you know in your heart or hearts. You don't need to make it an intellectual question, you need to make it, and I'm not a super feely guy but I've got emotions. Obviously anyone that's met me real or heard me knows I have passion. Why? Because I think we, the people, need to wake up and at some point we may be asked to stand up. It's not an intellectual exercise where we do these interviews, where it's entertainment about the coming crisis. We're in it and we need to make a decision ahead of time. Chance favors the prepared mind. Prepare yourself for what's coming and ask yourself some questions. If such and such happens, what will be my stance? It sounds good listening to David and Sean on the internet but if it really happens, what can you do personally to protect yourself, protect your family and stand up for what you know is right? Because we are not going to get to the other side where we need to be if everybody caves in, for the most part just having precious metals is a step but if they step in a total process. I want to emphasize that because a lot of people think unfortunately that money alone is going to save them. The problem that we are facing is not a money only problem. That's a symptom. The problem is the corruption at the top levels in this, what I very seldom say, Satanic monopoly that has engulfed the entire globe. Sean Kerrigan: I just want to support you David. Guys if you want to support David, visit silver-investor.com. You can sign up for his free email updates and get 30 days full member access absolutely for free. Another way to support David would be to buy his terrific book, The Silver Manifesto. You can click through on the ad at his site there silver-investor.com and get a copy of The Silver Manifesto. David I guess that pretty much sums it up, did I miss anything? David Morgan: No thank you. You caught me at a great time, I am a morning person, I had the most energy and I felt very zesty today I guess, because you're such a great interviewer and we have a lot in common. I've seen you grow, your site, your following and you're seeking the truth and remaining open minded. I would just add on slightly more, that when I spoke at the New Orleans Conference only for the second time, which you know, Greenspan and the secretary of defense has been down there, this is really a high end show. I got to meet Rory personally, Rory was basically through you. You are doing something important but more importantly it's starting to spread, that's the point I want to make. One man with a voice in the wilderness is one man with a voice in the wilderness, but 2, 3, 4 hear it, it starts to spread. To emphasize and close out on a positive note, the word is getting further and further to the populace. We may hit that tipping point. Maybe we'll hit that tipping point before things unravel further. Sean Kerrigan: Good. Yeah, I hope so. Thank you so much for your kind words, that really tickles me. It makes me feel really good, I appreciate that. It's nice of you to say those things. As I also like to say we're all in this mess together and at the end of the day it's the banksters versus humanity and I just hope humanity can figure out a way to pull this thing it out in the bottom of the night. Guys our guest has been David Morgan from Silver-Investor.com, home of The Morgan Report, a good friend to SGT Report, a good friend to all of us who fight on behalf of humanity. David thank you sir. David Morgan: My pleasure, thank you Sean.